Shu Chien joined UCSD in 1988 and became the founding chair of the Department of Bioengineering in 1994. In 2008, Chien became the founding Director of UC San Diego’s new Institute of Engineering in Medicine. 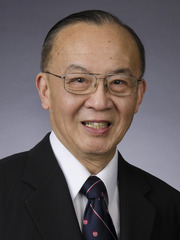 As principal investigator on the Whitaker Foundation Development Award (1993) and Leadership Award (1998), Chien played a major role in establishing UCSD’ bioengineering program as one of the top in the country. As founding Director of the Whitaker Institute of Biomedical Engineering at UCSD, he helps foster collaborations among the faculty of UCSD and with research institutes and biomedical companies in San Diego. As founding Director of the UC Systemwide Bioengineering Institute in California, he has facilitated collaborations in research and education among the ten UC campuses. In September 2006, Chien was named the inaugural holder of the Y.C. Fung Endowed Chair in Bioengineering at the Jacobs School. He is a member of the National Academy of Engineering, Institute of Medicine, National Academy of Sciences, and American Academy of Arts and Sciences. He received the National Medal of Science, the highest honor in science and engineering in the United States, in 2011. He received his M.D. from the National Taiwan University and his Ph.D. in Physiology from Columbia University, where he was a professor from 1969 to 1988. His research interests are molecular, cellular, and integrative bioengineering, with focus areas on mechanotransduction and mechanobiology of endothelial cells and role of extracellular environment in regulation of stem cell fate.